December 24th is never referred to as Christmas Eve in the MacGregor household. It's Noelle's birthday. Christmas, that's just the "day after Noelle's birthday." Although that is a stretch, it is not a stretch to say Rob makes sure he spoils Noelle every year. This year was no different. My day began with a present to open in bed from Jackson. He knows his mommy's taste (and likes to spoil himself) because he got me Five Little Monkeys Jumping on the Bed. For those of you that have never read the book, after all five monkeys fall off the bed, they go to sleep. Mommy monkey is glad because now she can go and jump on the bed herself. Jackson, who is very advanced for his age, wrote "Mommy, thanks for being a silly monkey. I love you." in the back of the book. Next I got a present from Rob. I have problems keeping up with my sunglasses. I lose them ALL THE TIME. In fact, I lost them earlier this week. Rob was able to locate the house I left them at, go pick them up, and buy me 3 exact copies as a gift. This gift dramatically increases the chances that I can find a pair of sunglasses. Next, Rob make me a delicious breakfast of french toast (with strawberries), hot sausage, country fried potatoes, and a Dr. Pepper. It was perfect. At breakfast I got my "big" present. Rob has been very nervous about this gift. I have to admit, I was completely surprised... and impressed. We had a tree die in our backyard. We've had discussions about getting it replaced. Just like we've discussed getting rid of a pine tree in our backyard (for years). Well, Rob did it! Not only did he have the dead tree removed, but he had it replaced with one of my favorite trees. He did all of this without me knowing, which is pretty amazing. The tree is a Bradford Pear Tree. I love it because it is one of the only trees, in Houston, that actually changes with the seasons. I love it most when it's fall. I have a while to wait, but it's worth it. 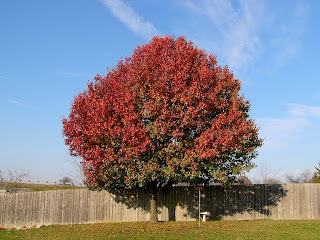 This is what the tree looks like at the beginning of fall. and many other things. And, of course, the birthday celebrations actually started the night of the 23rd when Rob's family took my out to dinner to one of my favorite places! Thanks everyone. I felt the love. That is a great birthday. The tree gift is a wonderful idea. Go Rob. Rob, I told ya you done good!! :) Sounds like a pretty wonderful birhtday!